Cape Town - This time last year, the Southern Kings were an accident waiting to happen after being voted off the Super Rugby island with the Cheetahs to join the PRO14 competition. Having finished Super Rugby in 11th spot out of 18 teams last year - above the Bulls and the Cheetahs - with rugby that made friends and influenced people, they lost 10 starting line-up players, as well as backroom staffers Dave Williams (Cheetahs), team doctor Konrad von Hagen and technical analyst Lindsay Weyer to the Springboks. And when they couldn't have a proper pre-season for their debut PRO14 season because they were scattered all over the country begging other unions to lend them players they weren't using, adverse results - one win from 21 games, to be exact - predictably followed. With a month to go to their second season in the tournament, they're pretty much exactly where they were this time last year. 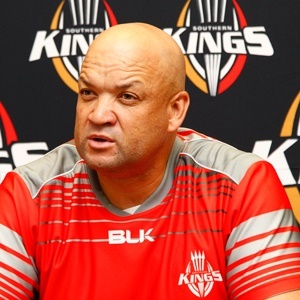 "We've been able to train with a squad of only 27 contracted players, 10 of whom are injured and following rehab programmes," said Kings coach Deon Davids. "We've invited young and talented players to train on a trial basis with us. This has affected our ability to do effective team and oppositional training. The lack of depth in certain positions has affected aspects of our preparation." On the backroom staff front, the Kings still don't have a forwards coach and have yet to contract a permanent physiotherapist or a performance analyst, and they struggle for such bare technological elite performance environment necessities as GPS monitors. Davids said the debrief of their disastrous first season in the European competition had, among other things, thrown up a need for finalising a balanced squad at an early stage, "which, unfortunately, has not happened"; the importance of a high-performance manager to implement structures and systems, and an environment critical to ensuring a competitive advantage; and the need for a mental coach. "As mentioned by (chief operating officer) Charl Crous in the media before, we've experienced budget challenges, which have tremendously affected our ability to implement the strategies we had in mind." To that end, the Kings have contracted four players in 34-year-old former Cheetahs' scrumhalf Sarel Pretorius from Welsh club Dragons, lock JC Astle and utility forward Schalk Oelofse from French Pro D2 side Mont-de-Marsan, and Fijian centre-wing Meli Rokoua, who has been playing in Portugal. The aforementioned injury list reads like a who's who of Kings' rugby: Sibusiso Sithole, Oliver Zono, CJ Velleman, Kurt Coleman, Luzuko Vulindlu, Godlen Masimla, Schalk Ferreira, Ruan Lerm, Andisa Ntsila, Ntabeni Dukisa, Pieter Scholtz, Martin Dreyer and Dries van Schalkwyk. With that kind of sickbay and the paucity of new signings, it wouldn't be a surprise if the Kings began their season on a poor footing again. "When we played against the Scarlets (last year), it was the first time I’d seen the team play together in a match situation," said Davids. "We'd had no friendlies and hardly any preparation, and suddenly we were playing the defending champions - it was scary." Yet South African fans will expect Davids' ambulance job routine to spring the kind of season they had in their last Super Rugby tournament. Not that he doesn't have expectations of his own of his charges in the competition. "I must commend the massive effort and work ethic of the squad in this pre-season," he said. "I think they made significant strides to improve as individuals, and worked hard on their strength and conditioning under the watchful eyes of our biokineticists Nadus Nieuwoudt and Chad Foong. "My first goal will be to ensure these players can prepare and play in an environment where they can have fun, express themselves and reach their full potential. It was against extremely challenging circumstances that we battled to prepare for this campaign," Davids said. In their maiden PRO14 campaign the Kings won a single match out of 21. How many will they win in the 2018/19 season?